Intaglio FISH Bowl - 7.5 in. across x 2 in. deep. Sloping sides. 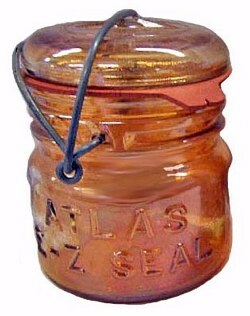 CANNING JAR: This pint size jar is not a “regular” in auctions of carnival glass. Depending upon a collectors desire for the unusual, this certainly answers the description. We feel certain that Atlas did not perform the iridization. 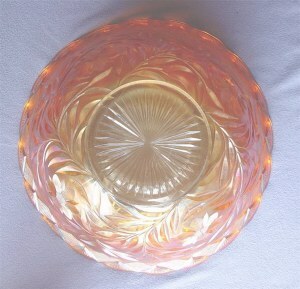 It exemplifies an after market effort in the form of a “special order” from a devout carnival glass collector. Agreed? It's a nice thought, anyway. FISH Bowl: The intaglio design is quite well done. We had not seen one of these prior to taking this photo while attending the 2006 Keystone Convention in Harrisburg, PA. 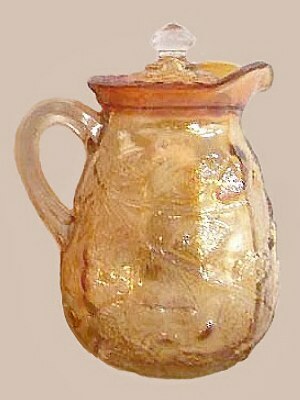 These are thought to be circa 1982 by Bennett Glass. Four different colors of this design were seen for sale in Bill Crowl's room at the 2008 ICGA Convention. 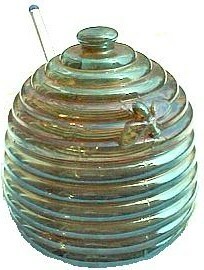 HONEYBEE Honeypot: This version was made by Jeannette Glass Co. 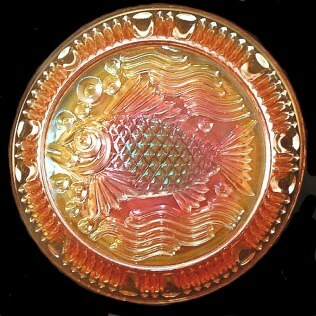 There are a couple of other honeypots which are known to be iridized, but the shape/design overall is different from this example. This teal blue color is quite attractive. DAHLIA or MAYFLOWER Compote 5.5 in. tall x 5 in. across x 2.75 in. base - Jenkins. DAHLIA: We classify this lovely marigold compote as a novelty, for to locate one which has been iridized is not an easy feat! The pattern is called No. 286 in the Jenkins Glass Co. line. 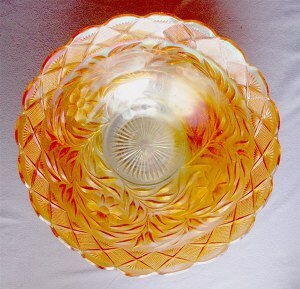 They were marketed in ice green (not iridized) and crystal glass, but the marigold examples in any of the shapes within the pattern are rarities. 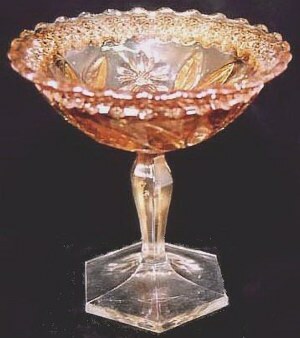 This flared compote derives from the jelly compote as shown on page 12 of JUST JENKINS by Joyce A. Hicks-c.1988. DAHLIA: This Punch Bowl could well be the only example in marigold. While attending the 2006 Keystone Convention in Harrisburg, PA, we discovered this lovely piece in Doug Siska's room. 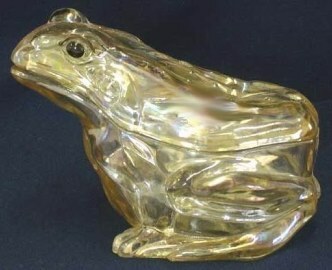 As you can imagine, it is quite a heavy piece of glass with top width of 17 ¼” and a depth of 6”. Diameter of the base (marie) is 6”. Our visit with Kay Riley of Kokomo, IN to examine her vast collection of Jenkins Glass revealed no example of this bowl, nor is it found listed in diagram fashion in the JUST JENKINS publication by Joyce Hicks. We display this piece in a novelty section by reason of its rarity and the fact that so little Jenkins glass was iridized. 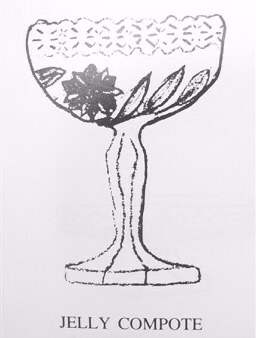 Handled cups are not shown among the 26 Dahlia shapes on display in the Hicks publication. Jenkins Line #475 PANELED CHERRY.Only one known.-$1200. Jenkins' No. 475 line - shown in JUST JENKINS by Joyce. 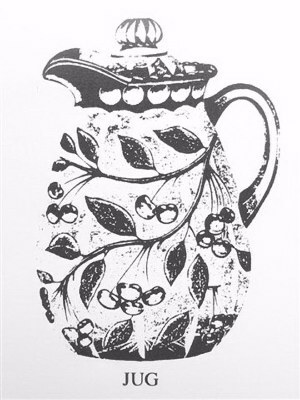 PANELED CHERRY: A butter dish, 6” nappy, 8” nappy & cover, toothpick, tumbler, stemmed goblet, handled cup, pint cream and this jug were all part of the No. 475 Jenkins Line in that pattern. They are shown on page 46 of JUST JENKINS by Joyce A. Hicks - c.1988. PENNY MATCH HOLDER- These are in iridized Purple carnival glass. These have sold in the $1,000 range. 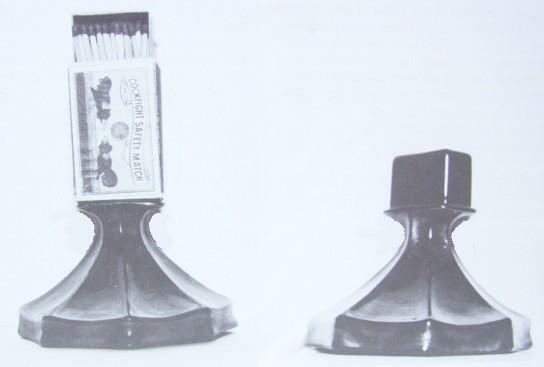 PENNY MATCH HOLDER: These are rarities which only surface occasionally over many years. They have all been found in dark purple base glass, always stirring great interest among a crowd at auction! Rudy Kovacs and Fred Warren - our 54th Wedding Anniversary. 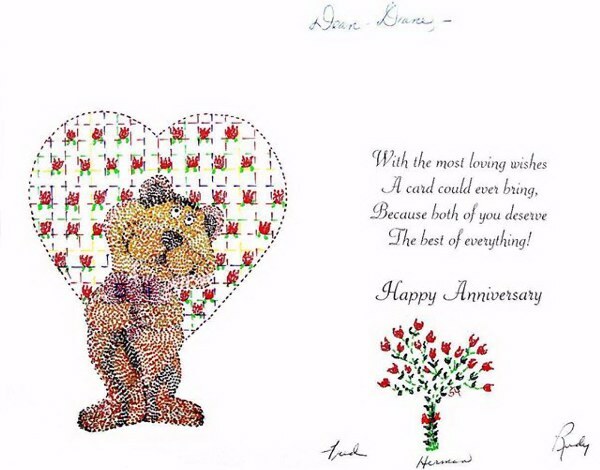 ANNIVERSARY CARD: Rudy Kovacs not only collects carnival glass, but has a pronounced and enviable talent with his colored pencils. Our Christmas, Birthday and Anniversary cards always arrive with one of his latest appropriate designs. We have quite a collection of them from over the years. Thank you Rudy, Fred and Herman. Your talents are much appreciated! The Lord has established His throne in heaven, and His kingdom rules over all. Bless the Lord, you His angels, who excel in strength, who do His word, heeding the voice of His word. Bless the Lord, all you His hosts, you ministers of His, who do His pleasure. Bless the Lord, all His works, in all places of His dominion.